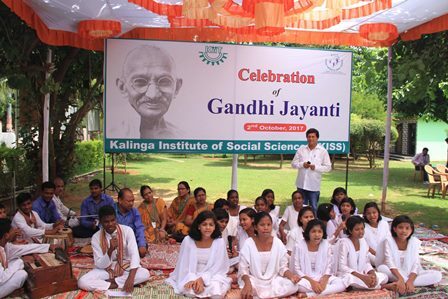 Gandhi and Shastri Jayanti were observed at the Kalinga Institute of Social Sciences (KISS) on Monday. On this occasion, students recited Ram-Dhun with devotion in commemoration of the the birth anniversary of the Father of the Nation. Members of Gandhi Global Family, Odisha, Dr. Achyuta Samanta, Dr. Dilip Srichandan, Rabi Behera, Dr. Shasanka Chudamani, Chinmaya Sunder Dash and Ashok Pandey attended the programme and paid floral tribute to Gandhi and Lal Bahadur Shastri, the 2nd Prime Minister of India. R.N. Dash, Secretary, KIIT & KISS; Dr. P. K. Routray, CEO, KISS and many other senior functionaries of KISS and KIIT University also graced the occasion. KIIT Group of Institutions including KISS & KIIT University also started a week-long Swachh Bharat Abhiyan (from 2nd to 9th October) to propagate the message of cleanliness among the students and residents of the surrounding areas. The staff of the KIIT Group of institutions assembled at the Exhibition Ground, KIIT Convention Centre early this morning to gratify such a noble initiative which was propounded by Prime Minister Narendra Modi. Later, all the staff members participated in the cleanliness activities organized in and around their respective campuses. Student and staff of KISS also cleaned the in and around of their institute’s premises.